Inspire Award Science Projects 2019 - Instructions for Preparing Project Report Book Download. 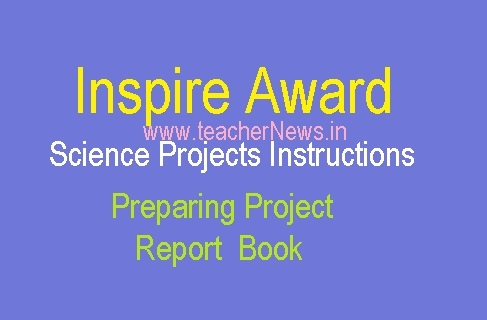 AP / TS Inspire Award Science 2019 Projects and Guidelines / Instructions for preparing Project Report Book and Sub title of Project Report Inspire Project Videos. 1.INSPIRE AWARDS Science “PROJECT REPORT BOOK” is to be prepared by computer DTP with simple MS-Word Format in Single side (One Side of the page) of A4- size paper. 3.Bring TWO (2) HARD COPIES (Printed Books) & TWO (2) SOFT COPIES (CD’S) of the “ PROJECT REPORT BOOK” . 4.One(1) set of PROJECT REPORT BOOK along with CD to be submitted at the Time of Registration in the Registration Counter. 5.Another set of PROJECT REPORT BOOK & CD keep along with you at the project / Model display Area. 6.If the Project is Selected for “State Exhibition”, then Immediately you will submit Hard & Soft copies of the WRITE-UP & PROJECT REPORT BOOK. Inspire Award Science 2019 Projects and Guidelines / Instructions for preparing Project Report Book and Sub title of Project Report Inspire Project Videos.